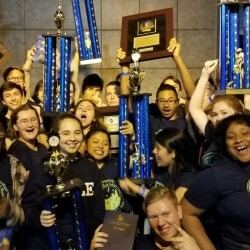 (ATLANTA, GA) Topping a long list of accolades earned at the WorldStrides 2019 Atlanta Heritage Festival, Charlottesville High School musicians won the Grand Championship Award, the highest honor bestowed upon a high school music program at the event. More than 200 CHS students and chaperones traveled to Atlanta on April 11-14 to participate in the festival. 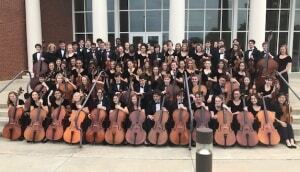 CHS band, orchestra, and choir members performed in the competition which included 18 ensembles from New York, California, Maryland, Kentucky, Alabama, and Virginia. The packed travel itinerary also provided opportunities to explore the host city, including an Atlanta Symphony Orchestra concert, a tour of the MLK Jr. Historic Site, a Braves/Mets game in the new SunTrust Park, and a visit to the Georgia Aquarium. The CHS music program is among the most decorated in Virginia, earning eleven “Blue Ribbons” from the Virginia Music Educators Association which recognizes schools whose top band, choir, and orchestra all earn superior ratings on annual district assessments. 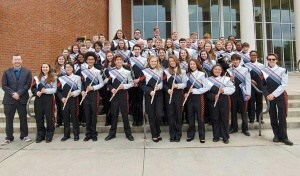 Earlier this month, the following CHS musicians earned top state honors by participating in the 2019 All-Virginia Choir, Bands, and Orchestra at the Richmond Marriott and Convention Center: Adria Cafferillo, Choir; Reid Dodson, Symphonic Band, Parker Nelson, Choir, Margaret Ann Doran, Choir, and Anna Bon-Harper, Symphonic Band, and Sarah Garretson, Orchestra. Finally, this weekend, tenth grader Dante Walker won the regional Omega Psi Phi Talent Hunt, held at Dulles. His piano skills outpaced a variety of performers, including dancers, actors, other pianists, and instrumentalists from across the state.